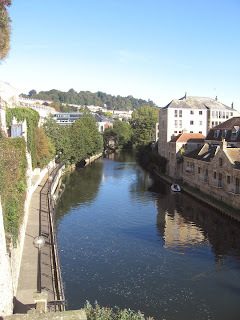 During my last visit to see Mathias, I went on an overnight trip to Bath. One of the English cathedrals Susan and I have wanted to see since our first trip to the UK way back in 2001 was Salisbury Cathedral. However, it is too far away from Birmingham to be a reasonable day trip by train. I discovered, however that it was only 50 minutes away from Bath. 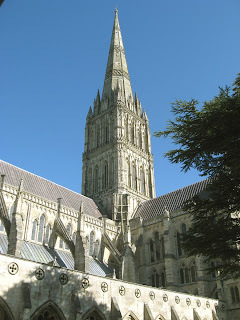 So in the morning of my Bath trip I went to Salisbury to visit the Cathedral. What an incredible place! The Cathedral construction began around 1320 and finished approximately 30 years later! 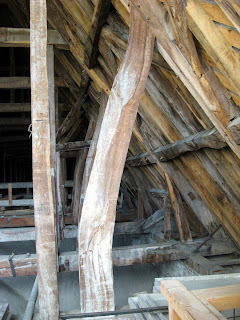 This is astounding for cathedral construction and explains why there is so little change from its original structure. 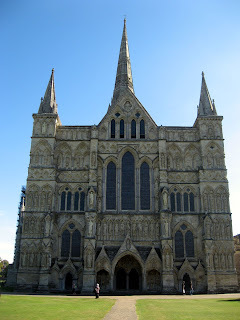 I will not ramble about the Cathedral, but please go to this link to read more about the Cathedral. The Cathedral showcases one of 3 original copies of the Magna Carta and a medieval clock that is the oldest operating clock in the world. I spent over five hours during my visit which included a tour of the construction of the spire, which is over 440 ft. above ground. The tour itself lasted over two hours and was by far the best guided tour of a building's history and construction I have ever been on. We even ventured outside the Cathedral at 220 ft above ground for some incredible views of the city. Of course, I had great weather again and took many pictures. Here are a few. Later this week Susan and I leave for Oregon for a long weekend (real cheap airline tickets) and will be spending the nights in very interesting accommodations. These will be posted in Susan's family blog. 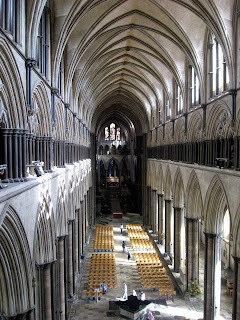 A view of the interior of the Cathedral for the organ level. This view is only available for those who go on the tower tour and is a MUST! 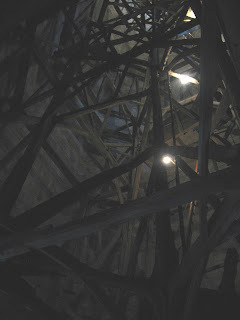 This is a view of the Cathedral's spire which climbs 440 ft. above ground. The tower tour takes you to the 220 ft. level. This photo shows the support beams of the spire which extends over 200 ft higher than the point where this picture was taken. Unfortunately we could not go higher which is probably a good thing since all ladders extend vertically and look really scary. 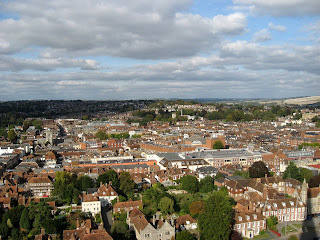 Here is a view of Salisbury from 220 ft above ground. 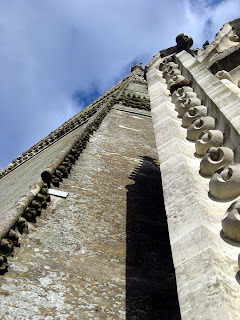 The picture above is a view of the Cathedral's spire which towers over 200 ft above this position. The walkway outside the church is barely 3 ft wide which makes taking these types of pictures a challenge and not for people that suffer from vertigo. 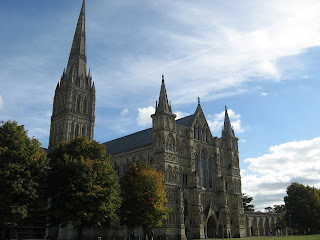 Please look at my very amateur video of Salisbury. One of the neat things about Mathias living in England is the fact that Susan and I get to travel to many wonderful places in the UK when we visit. 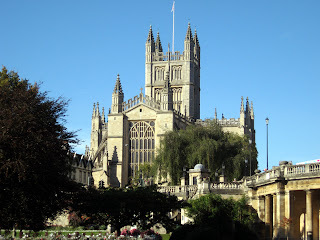 I finally got to go to Bath last month and visit Bath Abbey and the Roman Baths. Like Susan did earlier, I stayed at the YMCA in a single shared bath for 20 Pounds with a nice continental breakfast included. What a deal!! 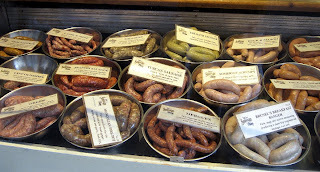 The location is great and close to all things to visit. 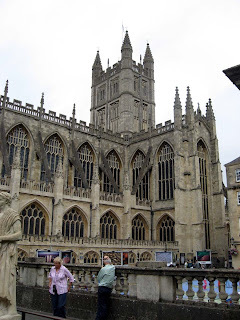 While I was there, I went to the Roman Baths, Bath Abbey, and the Bath Spa. 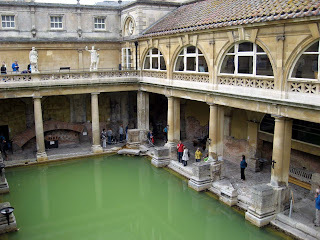 The Roman Bath self-tour is excellent with headphones included in the price. Make sure you listen to Bill Bryson's commentary. The Abbey is almost next door and is quite beautiful. I unfortunately did not take the tower tour (sold out) but saw a wonderful needlepoint and collage exhibit that Susan would have loved. I took pictures for her. Later in the afternoon I went to The Thermae Spa for a two-hour swim and steam adventure. The rooftop pool is quite spectacular when the sun sets (I had great weather.. it never rains in England when I visit! well most of the time). The only thing wrong with this visit is the simple fact that I was by myself. Since I was not there with anyone, I felt like an old creep, trying not to galk at the younger women who were there in pacts of 3 or 4. However, the steam rooms were to die for and worth the visit. 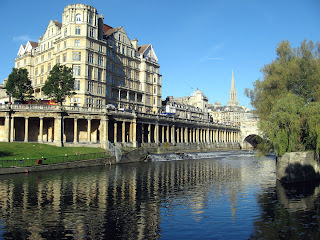 Here are a few pictures that I took in Bath. I'm getting better with my hand-me-down camera! This is one of the standard views of the Roman Baths that people see in the travel magazines. Here is another view of the River Avon. You can take boat tours up the Avon from Bath. If I had more time I may have done it since the weather was so good. 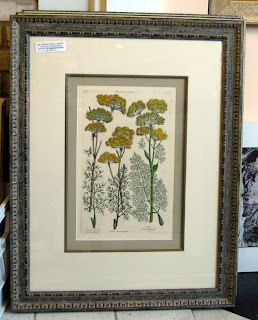 The Mouse House is proud to offer a wonderful set of 18Th century botanicals framed and ready to hang. 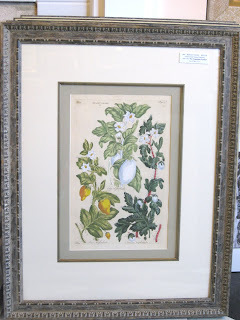 The botanicals are from The Vegetable System by John Hill which were published between 1759-1775. A total of 24 were framed and two sold this past Saturday. All are hang-colored (early) and framed identically with acid-free mats with fillet and acid-free backing. The price for each is $225.00 which is a great price; it is not uncommon to find these prints unframed at this cost or even greater. 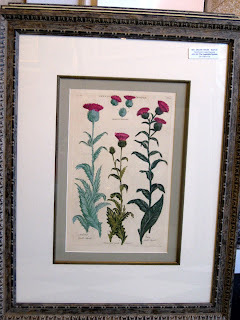 These botanicals will be at The Mouse House for at least one week and later several will be offered at Terrace Oaks Antique Mall in Charleston. Below are a few sample pictures of three botanicals from this set. The image size measures approximately 10 X 15.5 inches with the frame measuring (outside dimensions) approximately 23.5 X 29.7 inches. Please contact me if interested.